A must for anyone into fashion, in particular for any budding designers, is 100 Years of Fashion Illustration by Cally Blackman. Packed with around 400 images from the last century, it offers an overview of fashion through the years through illustration. From the restrained to the exotic, through to the "pop" images of the 60s and into the technology-assisted images of the modern era. And if you want a taster of the book before you buy, there’s an exhibition featuring the pick of the illustrations at the William Ling Fine Art Gallery in London. The book retails for around £18. Oooooh thank you! 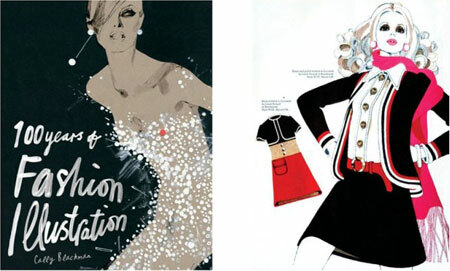 I love fashion illustration and have been looking for a good book but haven’t found one!